Stonehenge has haunted the British imagination for centuries. Jammed as it is between two busy motorways, with all the hustle and bustle of modern life, the ancient stone megaliths seem to brood in quiet contemplation of an age long gone. A vast number of theories have been put forward to explain the strange construction on Salisbury plain. 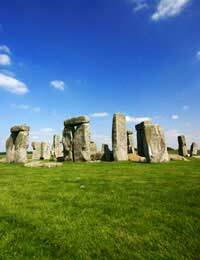 The great questions surrounding Stonehenge have always been the same: Who built it? Why did they build it? And how did they build it? Succeeding generations of scholars have answered the questions in different ways, but despite the best efforts of modern research, some of the answers still remain elusive. Stonehenge first appears in the documentary record in Geoffrey of Monmouth's History of the Kings of Britain, written in the 12th century. Referring to it as The Giants' Dance, he credited its construction to the wizard Merlin, who is said to have whisked the giant stones away from Ireland to Britain on the orders of Aurelius, a British king who desired to erect a monument to a group of Britons who had been murdered by the Saxons. Stonehenge - Who Built It? Mixing its construction in with figures from Arthurian legend would have dated it to around 400 - 500 A.D. Later theories pushed the hypothetical construction date back even further. Inigo Jones, in the 17th century, believed it had been built by the Romans. Others however, writing not long after Jones, believed it had been built in pre-Roman times by the Celtic priest sect known as the Druids. This theory, became the dominant one and still is down to the present-day. In fact, in more recent times, various societies of people claiming to be druids sprang up over the years and began holding ceremonies at the monument on the occasion of the summer and winter solstices. Large crowds often gathered at these ceremonies, even in the 19th century, but it's not clear how seriously any of it was taken. As venerable a figure as Winston Churchill is known to have been inducted into something calling itself the Ancient Order of Druids so perhaps the whole thing was regarded as a bit of a laugh. Even in our own day, people dressed in white, flowing robes and calling themselves druids continue to perform ceremonies at the Stonehenge site. It does seem that the monument's attribution to the druids may have been utterly wrong, however. Modern scholarship has dated the beginning of construction at Stonehenge to around 3000 B.C., pushing it back into the pre-historic age, before the druids are known to have lived. The truth is that we know very little about the Britons who lived in that time, so the 3000 B.C. date just makes Stonehenge more of a mystery than ever. Stonehenge - How Was It Constructed? The most obvious question begged by this earlier date is how did people living in such a primitive age, without the tools and techniques of modern engineering, manage to move the vast stones (the largest weighing up to 50 tons) over large distances and heft them into position? Various theories have been advanced to account for it. Some scholars have argued that the great stones could have been moved on a rolling carpet of logs; others believe they might have been transported on a kind of primitive un-wheeled railway wagon, sliding along lubricated and specially-built tracks. Stonehenge - What Was Its Purpose? The most intriguing question about Stonehenge has always been what is it for? Early speculation had the druids performing human sacrifices there and indeed, the headless body of a Saxon was recovered during 20th century excavations on the site but since William Stukeley first advanced the idea in the 17th century, the notion that there is a connection between Stonehenge and astronomy has gathered growing support and now constitutes the most common interpretation of the structure's purpose. Sir Norman Lockyer bolstered the case for this connection around the turn of the 20th century, arguing that Stonehenge was in fact, a calendar. But the strongest confirmation of the astronomical hypothesis came in the 1960s when the American professor Gerald Hawkins published his book Stonehenge Decoded, in which he demonstrated that on the day of a summer solstice, a person standing at key points in the structure would see the sun rise above the Heel Stone (one of the most distinctive stones in the site) and set between a trilithon, which is a three-stone arrangement of two vertical stones capped by a horizontal lintel. Hawkins believed the arrangement of stones could be used to predict eclipses. Modern research has clarified some of the uncertainties that previously existed about Stonehenge but has provided few definite answers. Indeed, in many ways recent scholarship has only added to the monument's mystery. For 5000 years, the structure on Salisbury Plain has continued to baffle and intrigue all those who have considered it and it seems it will continue to do so for many more. Stonehege In the English Heritage ‘Guide to Stonehenge’ there is a plate (based on Archaeological evidence) which shows that in the final Phase of Stonehenge there were originally 2 Heel stones, 2 Intermediate and 3 Portal stones outside the Henge. One does not need a Degree in Archaeology to recognise the pattern of those stones. Any one who ever looks up into the night sky would recognise the similarity in the Constellation of Orion. At Stonehenge it is (was) as if Orion was ‘folded down’ (in part) onto the ground. An observer standing in the centre of the Henge when constructed would have seen the middle belt star of Orion rise over the middle Portal stone and horizon between the Heel stones … astronomical evidence suggests it was around 6600 BC … the Age of Gemini -that is the Constellation which follows Orion. The Constellation outline of Gemini closely resembles the Grand Galley in the Great Pyramid and uncannily the outline of the Red Sea … at the top of which are the Gemini stars, Castor, Pollux and Kappa - whose pattern mimics that of the ground plan of the Pyramids. It does seem to be apparent that Stonehenge was a religious centre of some kind, one that drew people from all over –examination skeletons found there show they came from around Europe; they weren’t just local. It’s certainly worth a visit, a remarkable place and a wonderful feat of engineering – and how they did it we may never know.